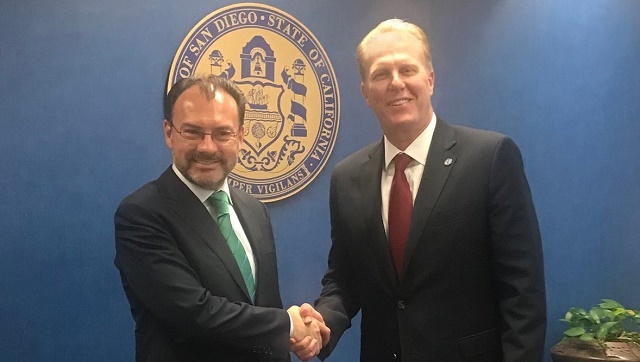 San Diego Mayor Kevin Faulconer is in Washington this week to lead a discussion of the new cross-border trade agreement with other U.S. mayors. The three-day U.S. Conference of Mayors‘ 87th winter meeting begins Wednesday with some 250 mayors of cities with populations of 30,000 or more scheduled to attend. Faulconer will lead a special forum on trade and the United States-Mexico-Canada Agreement reached last year to replace NAFTA. He is urging Congress to give final approval to the new trade pact. He is co-chair, along with mayors from cities in Canada and Mexico, of the mayors conference’s Alliance on Trade in the Americas, a board that works to strengthen economic ties and cross-border commerce in North America. Faulconer’s counterpart from Los Angeles, Mayor Eric Garcetti, will moderate a discussion titled “Assuring a Full and Fair 2020 Census and Inclusive Immigration Policies,” as he is chair of the Latino Alliance of the U.S. Conference of Mayors. The mayors are scheduled to hear from House Speaker Nancy Pelosi, Treasury Secretary Steven Mnuchin and a number of potential 2020 presidential candidates.